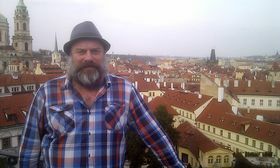 Glen Emery has been in Prague since the early 1990s and today owns the lively and cosmopolitan bar Bukowski’s in Žižkov. But the Canadian, a font of great anecdotes and with a keen interest in history, started out in the city with Jo’s Bar, just off the main square in Malá Strana, or the Lesser Quarter. 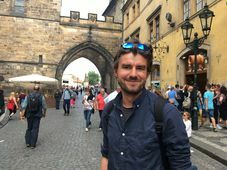 In this edition of My Prague, Emery takes us on a short tour of the area, which lies below Prague Castle on the left bank of the River Vltava. 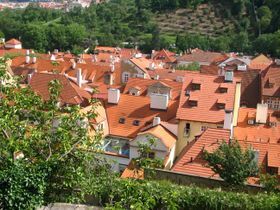 “We’re at the top of the Vrtbovské Zahrady in Malá Strana, some gardens that I think were completely rebuilt about 15 years ago. But back in the day it was all closed, and it had been closed for decades. “All of these statues that you see here at the time were originals made by [Matthias] Braun, I guess he was from the 18th century, who did most of the statues on Charles Bridge. But you can see that they have all been replaced by models. “Back in the day I sort of discovered this garden because we were coming down the hill here and we jumped over the wall into the church where the Bambino di Praga is [the Carmelite Church of Our Lady Victorious], then we jumped over another wall, and then we jumped over this wall and all of a sudden we were in this garden. “We used to come in here all the time. We had it completely to ourselves. We’d bring a few beers or a bottle of wine and sit at the top here and overlook the city. We had complete quiet. 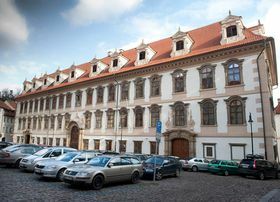 Vrtbovská Zahrada, photo: © City of Prague “Most of these buildings were abandoned. This building where the Irish Embassy is now was completely abandoned. This door here was open and we used to go through it and into the building. “The first time I went in there I walked all the way through and everything had been ripped out, including all the wires and everything. I walked in and I turned a corner and over on a window sill I saw a telephone [laughs]. “So I went over and I picked up the phone and of course there was a dial tone. So I called my mom. At the time I had Jo’s Bar over here on [the square] Malostranské náměstí. I talked to my mom and my sister for about an hour. I told a few of the guys who were there from Canada; I said, follow me [laughs]. “So we loaded up some wine and beer and jumped over all the fences, got into here, went in through the door and we sat in there for about three hours and called all of our friends. 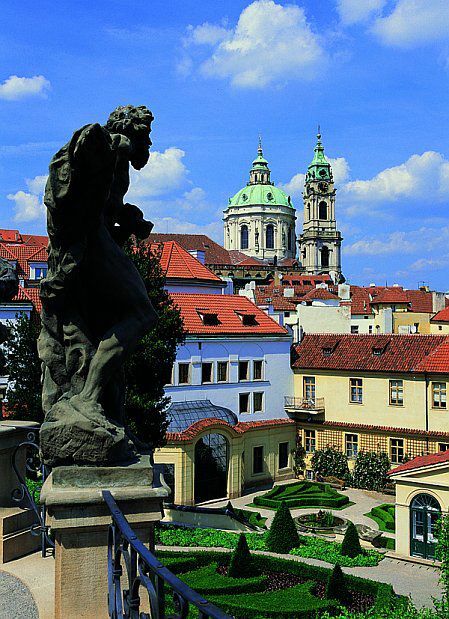 What’s your own connection to Malá Strana? What’s it like to live here? For me it seems like tourist city, tourist central. 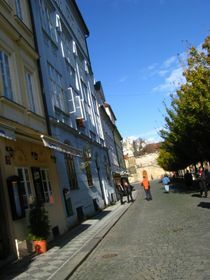 “The tourists are pretty much concentrated on the square, Mostecká St. and Nerudova up to the Castle. Do many regular people live here? 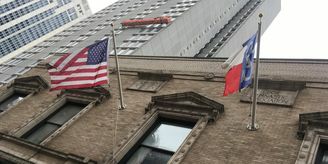 Also you had here the embassies. “And the embassies, yes, all the embassies. Some places that were very famous during the ‘50s and ‘60s for entertainment, including all of Malá Strana, were completely decimated during communism. “They got rid of all the famous pubs – or they used to be famous pubs and then the Communists turned them into horrible restaurants. And it lost all its flavour. “And a lot of the places were completely abandoned. Like U Glaubiců was completely abandoned. They sort of ruined the feel. 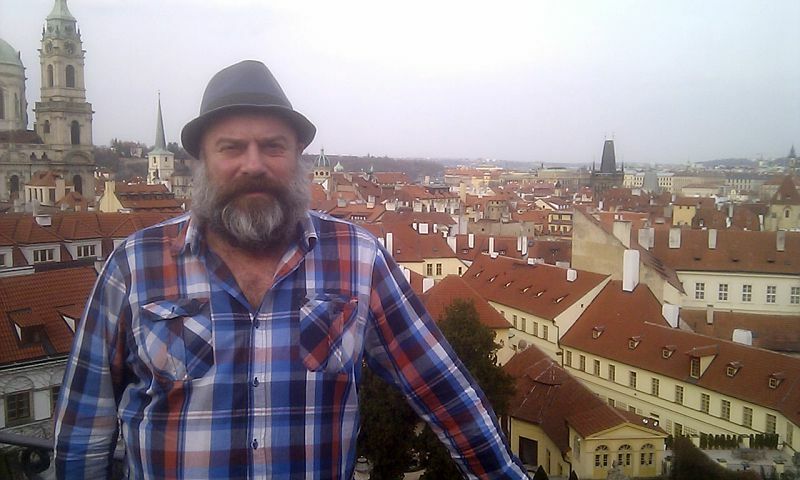 “In fact, when I opened my place in the early ‘90s we got a lot of these Czech emigrants who had lived in New York for 30 years and come back, and they were telling me all the stories about living here in the ‘50s and the ‘60s and how it was THE place to go. 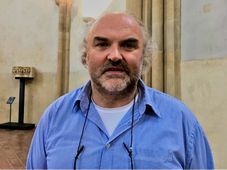 St. Thomas’ Church, photo: archive of Radio Prague From Vrtbovská Zahrada, Glen Emery takes me perhaps 300 metres to another place I’ve never been before, St. Thomas’ Church. The courtyard of the Augustinian church, which dates back to the 13th century, is a wonderful oasis of peace mere metres away from Malá Strana’s bustling streets. 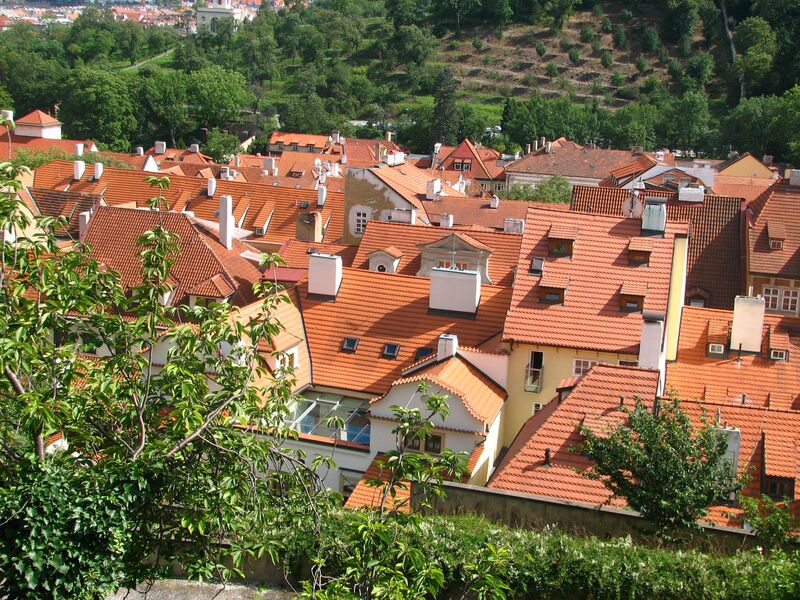 “It’s sort of hidden down a little backstreet and off of Malostranské náměstí. 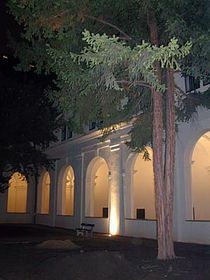 It has this beautiful courtyard inside as you can see, which is open to the public. But very few people come in here. And there are all sorts of ancient crypts in the walkway around the courtyard. Is it a hotel now? Would you say there are many hidden corners like this in Malá Strana? “Yes, there are lots. And there are lots I’ve never seen. Because every time I meet someone new who’s living in a different building, you go into the building and they’ve got a beautiful courtyard with a beautiful view. So there are lots of hidden corners like this. Also a lot of the government buildings are around here. 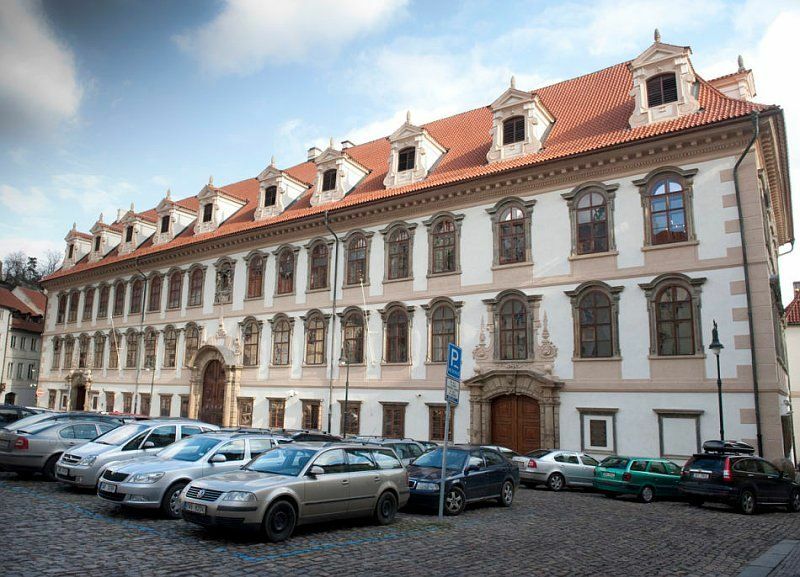 I’ve got to say I think it’s kind of cool that the government is where it is, in this historic, beautiful old part of the city, not in some modern building a bit out of the centre [the Chamber of Deputies is just off Malostranské náměstí and the Senate is five minutes’ walk away]. Also you get some of the politicians going to the pubs, or the wine bars. “Going to the pubs, exactly. When I had Jo’s Bar we’d get a lot of the politicians coming in after they’d been out drinking somewhere else. They’d come to my place and think nobody could understand them because it was all foreigners. 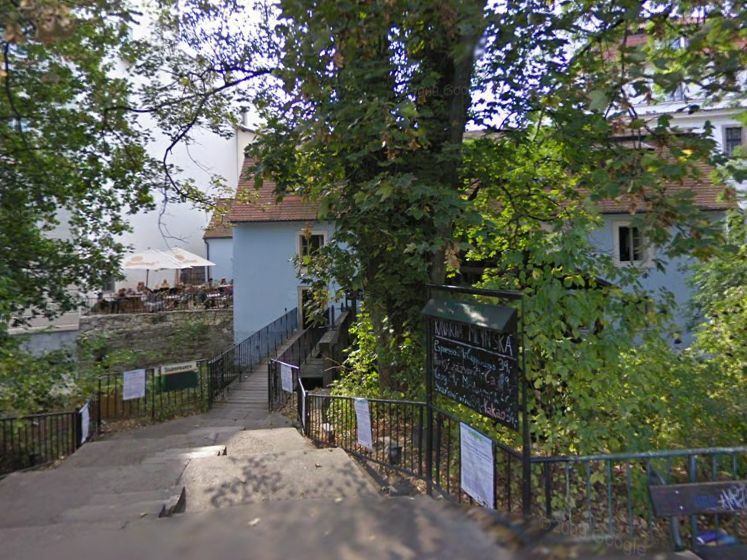 Mlýnská kavárna, photo: Google Street View After the pretty views and all that talk about quiet corners, it’s time for a pivo, and Emery suggests we grab a couple at a popular spot at the Újezd end of Kampa Island; Mlýnská kavárna translates as Mill Café, though it is widely known by the slangy Mlejn. “It’s an old mill. It’s a cute little place. You have to walk over a little bridge [across the Čertovka] and there’s a mill turning around. We’ve got the equipment right in front of us here. Isn’t this the place where the unsuccessful presidential candidate, the foreign minster, Karel Schwarzenberg, goes to drink? At least I’ve seen him here. “Yeah, he shows up quite often. 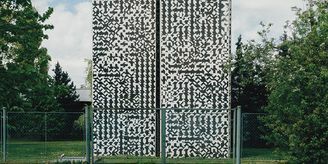 The owner of this place, Martin Kotas, and [artist] David Černy and a lot of the other guys…what’s his name, the economist? You’ve been working and living in this part of the city for 20 years or more, on and off. 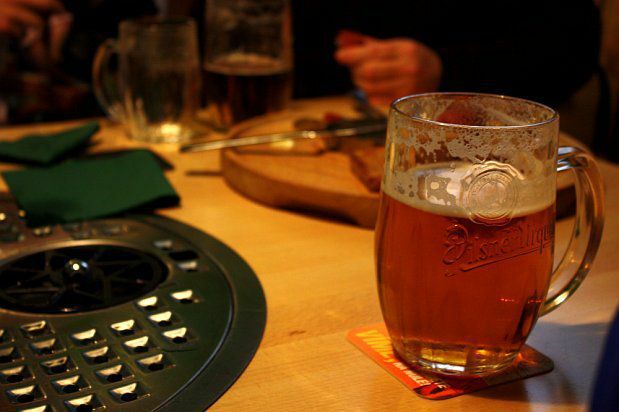 Are there a lot of the old school bars – or pubs, rather – still in existence in Malá Strana? “Yeah, there are a few, there are a few. Not so many. I think the only one that’s still in its original form is U Černého Vola, at the top of the hill. Not that that’s necessarily a good thing, because they’re snarly, burly, gnarly old guys and there’s really bad service, but I guess it’s got a certain charm. You mentioned U Černého Vola – does an old school pub like that welcome tourists or people who are outsiders coming in at all? Personally I don’t go to those places because I think they’re not for me. You daren’t sit at the table where the old guys sit every night? 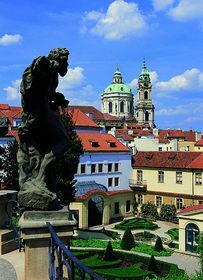 Otherwise, if we think about the whole of Prague, what are the particular pubs that you go to, or would recommend to people? “It’s hard to recommend, because everybody likes different things. I don’t like noisy music bars any more. I used to when I was younger, but now I like to go to a place where I can sit and talk with my mates and not have to fight to hear somebody over the music. “Even the Golden Tiger [U Zlatého tygra] is too noisy and there are too many taxi driver types and sports people. “But U Medvídků is one of my favourites. It’s an evergreen, always good, the people are friendly, the beer’s good. I like to go to U kata. It’s the same thing – the music’s low, it’s a nice place, friendly staff. When you mention the noise, I think that’s to do with the acoustics. Even here it’s relatively noisy, compared to a pub in Ireland or the UK, say. Because they’re open spaces, with tiles, there are no corners. “Yeah, it’s true, they love their tiles. Although, having said that, the Golden Tiger is different and there shouldn’t be bad acoustics. I’ve been there and made notice of it. I was there from opening until close one time, with a friend. As people get drunker, the volume increases. That’s where it comes from basically. 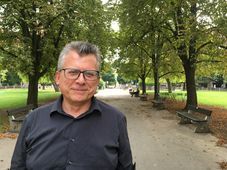 Former Prague mayor Jan Kasl takes us to his Bubeneč ‘hood and Malá Strana, where he lived at an exciting time.